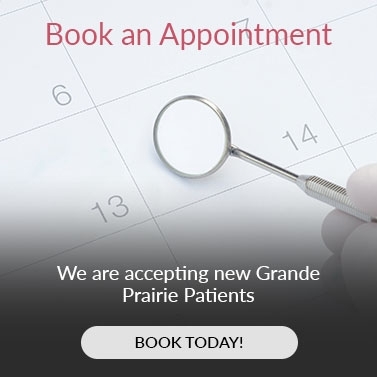 At Prairie Mall Dental in Grande Prairie, our dentists offer dental implants to replace missing teeth. As we age, it is common to lose teeth due to disease, injury, or simple daily wear. If you are missing one, two or several teeth; we may recommend a dental implant to replace your missing teeth. Dental implants are sturdy titanium posts that are anchored directly into the jawbone and capped with a realistic replacement tooth to mimic the same security and function of a natural tooth. Certain medical conditions may lower the success rate for implant dentistry. For that reason, we recommend a consultation with one of our dentists, to learn if dental implants are right for you. If you think dental implants are right for you, please contact our team and make your dentist appointment today. Our practice manage Susan and Prairie Mall Dental team members Anita and Christine partner with 100 Women in Grande Prairie to support local organizations. We are your family dentist in Grande Prairie. At Prairie Mall Dental, our team of dentists, dental hygienists and dental assistants make your smile our priority.